Is it drugs, medicines or explosives? At the Analytica trade fair, Fraunhofer researchers, joined by the Hübner Company, are presenting a terahertz spectrometer that provides reliable, contact-free identification of substances. December 2011: Security forces intercept a letter bomb addressed to Josef Ackermann, the head of Deutsche Bank. At almost the same moment, a letter bomb explodes in an office in Rome. The hand of the manager in charge of Equitalia, the tax-collection authority, was injured. Until now, police officers or security staff have had to conduct painstaking inspections of any suspicious parcels and letters by hand - an error-prone approach. At the end of 2011, though, the scanner T-Cognition 1.0 from Hübner company of Kassel, Germany, went on the market. The device, developed with the assistance of Fraunhofer researchers, detects, without contact, substances such as drugs or explosives contained in unopened letters or flat packages. The partners will be demonstrating the scanner at the Analytica trade fair in Munich (April 17-19) at the joint Fraunhofer stand (Stand 433/530 in Hall A1). „You place the suspicious parcels or letters in a kind of drawer, and the device uses terahertz waves to determine whether it contains explosives. This protects confidentiality, and the mail can then be delivered safely,“ explains Dr. Joachim Jonuscheit, deputy division director at the Kaiserslautern facility of the Fraunhofer Institute for Physical Measurement Techniques IPM and the researcher in charge of terahertz analysis there. The attacks in Rome and Frankfurt fueled the security industry‘s interest in the analysis device. „Most dielectric materials, such as plastics, clothing or paper, are transparent to microwaves and can also be penetrated by terahertz waves with comparatively low reduction. For non-destructive non-destructive testing, the terahertz range is extremely interesting,“ the expert adds. On the electromagnetic spectrum, terahertz waves can be found at the junction between microwaves and infrared radiation. The frequency range extends from 100 GHz to 10 THz; this corresponds to a wavelength from 3 mm to 30 µm. Terahertz waves combine the benefits of the adjoining spectral ranges: high penetration depth and low scatter, accompanied by good spatial resolution and the capability of spectral identification of unknown substances. Like radiation in the infrared range, Terahertz waves reveal a substance‘s spectral signature. The measurement device features a database with the spectral „fingerprints“ of hazardous materials and can be extended to include additional materials at any time. The device compares the spectral fingerprint of the substance to analyze with values in its database and returns a clear result. The scanner operates using transmission and reflection analysis. 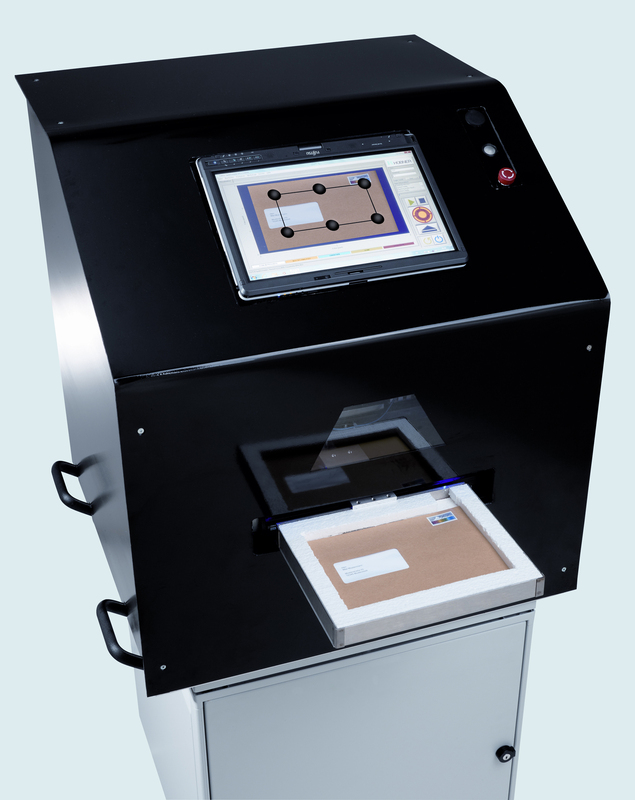 In safety checks, the terahertz wave offers low-loss penetration of envelopes made of paper or plastic to detect any chemical substances within. If a package contains, say, metal – as housing for an explosive device – the wave is reflected and measured by the receiver. This is how suspicious packages can be identified quickly. Now the researchers also want to gain a foothold in the pharmaceuticals and chemicals industries. „Up until now, makers of pharmaceuticals had to prepare extra samples if they wanted to find out whether the mixture ratio in a particular drug was right, whether the chemical was in the desired crystalline structure, and whether quality was all right,“ Jonuscheit points out. „Depending on the substance and the material involved, our device clearly detects all of the chemicals found. It also provides basic analysis of the mixture ratio of multiple substances. Terahertz analysis also allows conclusions about the substances‘ crystalline structure. For instance, you can determine whether a potentially unwanted recrystallization has taken place. In the future, this can spare chemicals and pharmaceuticals manufacturers painstaking preliminary analysis and sample preparation,“ the expert points out.